Can I Make Chocolate Doughnut Holes From a Cake Mix? 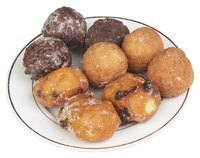 Those bite-sized doughnut holes offered at donut shops are hard to resist, but if you like cake-style donuts that are baked, rather than fried, you can easily make your favorite flavor of donut holes at home with a box of cake mix and a donut pan. If chocolate is your weakness, pick up a box of your favorite chocolate cake mix and you'll soon have dozens of breakfast sweets to enjoy with your morning coffee. Preheat your oven to 400 degrees Fahrenheit and grease both the bottom and top part of a doughnut hole pan generously with vegetable oil. Doughnut hole pans come with a top pan to cover the bottom pan for perfectly round doughnuts. However, you do not have to have one to make the doughnut holes. You can use a mini muffin pan instead, which typically hold 24 muffins. The shape of the doughnut holes will not be fully round, however, taking on more of a miniature cupcake shape. Choose your favorite store-bought chocolate cake mix and pour the mix into a mixing bowl. The cake mix already has the flour, sugar, baking powder and cocoa powder needed for chocolate cake, which saves you time and effort. For each box of cake mix you use, add 3/4 cup buttermilk, 2 whole eggs and 2 tablespoons of melted butter to the mixing bowl. Stir the ingredients together until the mixture is smooth with no lumps. Spoon the batter into the cups of the bottom doughnut hole pan, filling to the top. Cover it with the top doughnut hole pan, using the clips to lock the pans together. If you are using a muffin pan, fill the cups up about three-quarters of the way up. Place the pan in the oven to bake for about 8 to 10 minutes, or until a toothpick inserted in the middle of each doughnut comes out clean. Allow the doughnuts to cool in the pan for about five minutes before removing from the pan and cooling the rest of the way on a wire rack. You can enjoy the doughnuts plain or with glaze. A vanilla glaze can be made on the stovetop with powdered sugar, 1 teaspoon of vanilla and enough milk to get the thickness your desire. Whisk the mixture over low heat until a smooth glaze is created. Lower the heat even more without turning it off completely and dunk the cooled doughnut holes in the glaze to coat. Place the doughnuts on a cooling rack with parchment paper underneath to allow the glaze to harden. If you want to make a chocolate glaze for the chocolate doughnut holes, heat mini chocolate chips with 4 butter and corn syrup gently in a double boiler or in the microwave until fully melted. Stir water to thin out the glaze and quickly coat the doughnuts in the chocolate glaze before it hardens.